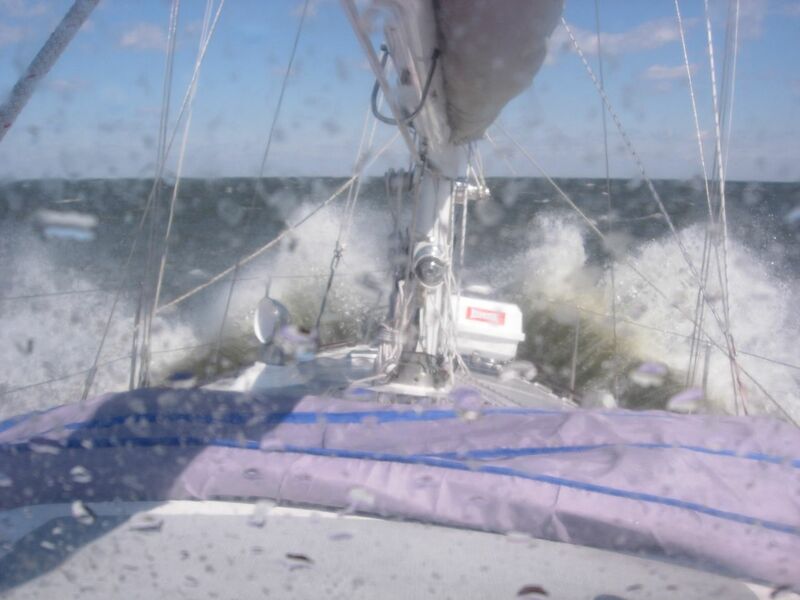 Pushing north under power on Pamlico Sound in winter. The boat is a Passport 40. I just returned to Oriental, NC, after helping to move a boat north to Annapolis, MD for a friend. It is still a little bit early in the season to be heading north, and the crew was chilled by the biting north wind that slowed our progress. Still, it was a successful trip made without any unpleasant surprises. One of the most memorable aspects of that short (just under 360 miles in 4 days) trip was that it was marked by almost constant headwinds. Our progress was slowed to speeds frequently below 4 knots, and to less than one knot for one short, but painfully slow stretch even though the boat’s powerful diesel engine was working hard enough to have pushed us at over 6 knots had we been in calm seas. To have frequent northerlies at this time of year is to be expected, and we certainly had our share. The same trip could likely have been made with warm winds at our backs in just another month or two, but then the anchorages and marinas would be crowded with others out enjoying the spring breezes. In my own cruising life, uncrowded waterways and anchorages are among the reasons that can make cruising out of season an attractive venture. I am often content to travel out of season and take my lumps. It’s not even really necessary to get beaten up too badly by the weather. This most recent trip was made through the contrary winds of winter in order to adhere to a schedule, but free of the push to be at our destination as soon as possible it could have been an easy trip even though it was still winter. The beautiful days don’t come as frequently when cruising out of season, but for one who is willing to wait, there are still plenty of fair winds to be had even though the temperatures may be chilly. One may enjoy the truly exquisite days when they do arrive with the additional satisfaction of having had to endure a little discomfort to “earn” them, and the uncrowded anchorage at day’s end or voyage’s end is shared only with the hardier of nature’s creatures.